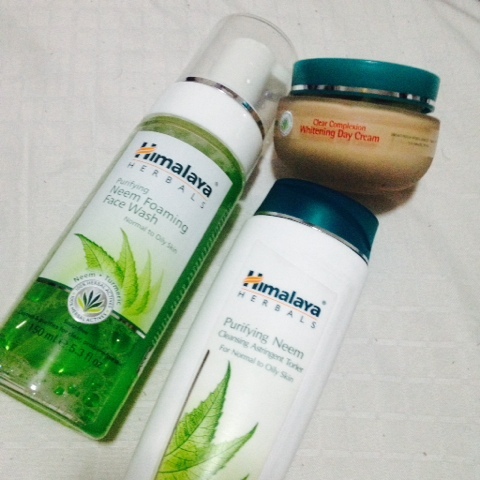 Himalaya Herbals Purifying Neem Skin Care* | Vanity and Everything in Between. Hey guys, are you familiar with this brand? The first time I encountered these products was last year when they were sent to me. As I've mentioned on my previous posts, I change skin care products at least monthly (I think it's an apple time to check whether a certain skin product works or not). The products above were my skin care products for this June but I just had to stop using it because I broke out so bad. I had 2 acnes on my face - on the side of the chin and on my cheek. I've been thinking what I ate wrong or if I had a new routine but there was none apart from these skin care products. After two weeks of using this, I finally stopped and gave up. I didn't feel my face was clean enough after using the facial wash. The toner stings! The whitening day cream has this weird scent that lasts the whole day! I'm just frustrated because I know several people that love this brand. Well, that's it. Just wanted to share if mine is an isolated case because most of the reviews I've read so far were good. I'm using Avene again as my facial cleanser until the end of the month. I tried this last year when I got samples from Sampleroom but it did work on my skin. It helped lessen the breakouts though it made my skin dry. Sad to know that your skin reacted otherwise. What a shame! Are you sure it's not yet expired? The only time I react is when I'm using expired products... rarely because of the product itself. Not expired. Earliest expiration of the products is July 2016 :( it's frustrating cos the clear face I had for 2 months was immediately gone when I started using this. I don't recall using too much concealer to cover up acne. Actually I don't remember the last time I had one haha! Basta toner for me, it should be alcohol-free :) Judging by looks parang eskinol or maxi peel may sting sensation din. Hehe. Ang alam ko lang na alcohol free is yung sa Avene but it's expensive haha. Di ready ang wallet ko! May time tinigil ko ang toner, kasi may mga nabasa ako sa google na hindi naman yun masyadong necessary. Hehe. Yung celeteque toner gamit ko ngayon, kasi nabasa ko alcohol free! Haha. Ikaw pa, kapag skincare pricey kapag cosmetics kaya. Haha. Gusto ko na din matry ang Avene, pero one product at a time lang. I haven't tried the Neem line of Himalaya Herbals but i tried their whitening facial wash. I can't think of anything negative about it but after finishing a tube, i switched to Celeteque Brightening facial wash just because i want to try it. I did not notice any whitening effect but it's okay since i used it just for a month and just the facial wash, not the whole whitening line. I thought of buying the facial cream from the Neem line but when i have read that it has Parabens, i changed my mind and didn't purchased it.